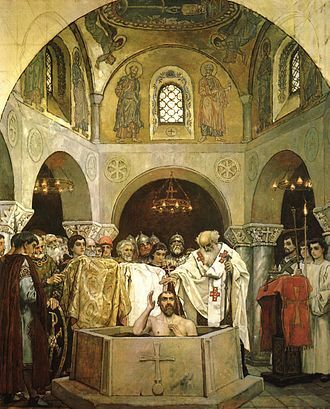 An 1890 sketch for St. Vladimir’s Cathedral, Kiev: The Baptism of Saint Vladimir by Viktor Vasnetsov. This is the third article in a four-part series addressing the subject of salvation and what it means to “believe the Gospel”. The first article was entitled Salvation – the Gospel. The second article was entitled Repent and Believe the Gospel! The next step on our journey to the gospel plan is water baptism in the name of Jesus Christ for the remission of sins. Baptism was preached by Peter in Acts 2:38. The proper method of baptism is by total immersion. This is how we identify with the burial of Jesus Christ. The word “burial” means: to put a dead body in the earth, a tomb, etc. ; to hid or cover; to immerse. The only mode of baptism that can qualify as a “burial” is total immersion. The English word “baptism” is derived from the Greek word “baptizo” which means to dip, to plunge, or immerse. Since water baptism is likened unto a burial, it demands complete immersion. During a burial, I’ve never seen anyone just sprinkle a small amount of dirt over a dead body. A “burial” demands total immersion. Since the “old man” has died in repentance, he, therefore, must be “buried” in water baptism. The scriptures clearly reveal that water baptism is an essential part of the salvation plan. In Acts 2:38 were are told that sins are remitted in water baptism. The dictionary meaning of remission is to cancel a debt, charge or penalty. Indeed, the gospel plan cancels our debt of sin. Many people place a heavy emphasis on “faith” and faith alone. However, it is impossible to separate faith and baptism. Baptism is an expression of ones faith and obedience. Here in John chapter three Jesus is referring to water baptism in His Name. Water baptism is an essential part of the gospel plan of salvation often referred to as the “New Birth”. A person must be born of the water and of the Spirit in order to enter into the kingdom of God. We will discuss the baptism of the Spirit in the final article of this series. The scriptures are clear on the mode and method of baptism. The Acts of the Apostles, which is a history of the early church provides numerous examples of water baptism. In Acts 2:38 three thousand believers were baptized in Jesus name. In Acts 8:16 the Samaritans were baptized in Jesus name. In Acts 10:38 Cornelius and his household were baptized in Jesus name. In Acts 19:5 the men of the city of Ephesus were baptized in Jesus name. The scriptures reveal that baptism was by total immersion in water administered in the Name of Jesus Christ. The “name” that is above all names must be called or “invoked” over the candidate for baptism. Peter preached the first salvation message on the Day of Pentecost. He was the spokesman for the other apostle. In Matthew 16:18-19 Jesus Himself had given Peter the “keys” to the Kingdom. As Peter preached in Acts chapter two all of the Apostles were present (Acts 2:14-38). There is NO indication in scripture that they disagreed with Peter’s salvation message. Baptism is an essential part of the plan of salvation, and the name of Jesus is the only saving name. That word “must” is a final, demand word. We “must” be baptized in the name of Jesus. There are some folks who will do everything in “Jesus name” except submit to water baptism in that name. Baptism includes both “word” and “deed”. Matthew 28:19 has been the source of considerable confusion regarding the manner in which water baptism is to be performed. Many consider Matthew 28:19 as the proof scripture for water baptism. They might even declare that they would rather follow the commands of Jesus than the Apostles. However, please remember that there is no record in scripture of Jesus baptizing anyone. Matthew 28:19 is a command from Jesus. Jesus did not say repeat after me! His disciples carried out His command by baptizing in “Jesus name”. Notice that the scripture points to “the name” that is singular. So we are commanded to “baptize” in one “name.” Father, Son, and Holy Ghost are not names but titles. I am a “father”, someone’s “son” and someone else’s “husband”. However, I only have one name, and it is not “father”, “son” or “husband”. I certainly couldn’t sign a legal document as “father” or “son”. So what is the “name” of the “Son” in Matthew 28:19? Well, that one’s easy. The name of the Son is Jesus. Matthew 1:21 states that “thou shalt call his name Jesus.” Well, then what’s the name of the Father? Is it “Father”? The name of the Father is Jesus because in John 5:43 the scriptures declare “I am come in may Father’s name.” What about the “Holy Ghost”? John 14:26 states “But the Comforter, which is the Holy Ghost, whom the Father will send in my name.” The power of salvation is in the name of Jesus. Jesus was the name of the father, son and Holy Ghost! Luke 24:47 (KJV) – And that repentance and remission of sins should be preached in his name among all nations, beginning at Jerusalem. This is Jesus Himself speaking in Luke chapter 24. He is giving a clear command that when repentance and remission of sins are preached it should be done in His Name. When a person repents and is water baptized in Jesus name remission of sins follows. Jesus clearly states that water baptism should be in His name. Aren’t you glad that the Lord has made away for us. He has a plan for you and me! This was the third article in a series on the plan of salvation. The first article was entitled Salvation – the Gospel. The second article was entitled Repent and Believe the Gospel. Repent and Believe the Gospel! Enjoyed it Ron. Romans says it all. I really enjoyed this read… please continue the work.